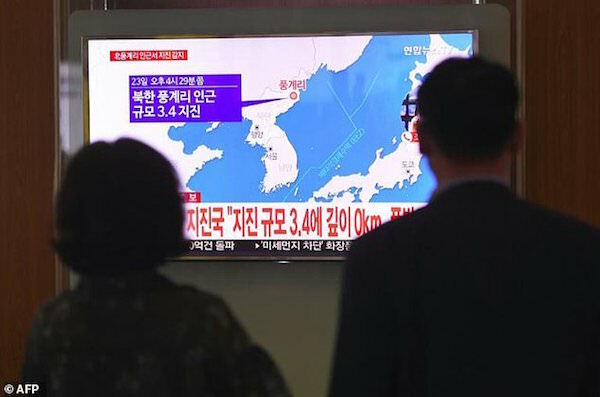 A shallow 3.5-magnitude earthquake hit North Korea near the country’s nuclear test site Saturday, US seismologists said, in what China’s seismic service said was a “suspected explosion”, but Seoul deemed a “natural earthquake”. The earthquake came after days of increasingly bellicose rhetoric between US President Donald Trump and North Korean leader Kim Jong-Un’s regime over Pyongyang’s nuclear ambitions raised international alarm. The United States Geological Survey (USGS) said the quake struck around 20 kilometres (12 miles) away from the North’s nuclear test site, where earlier this month it detonated its sixth and largest device, which it claimed to be a hydrogen bomb capable of being launched onto a missile. “This event occurred in the area of the previous North Korean Nuclear tests. We cannot conclusively confirm at this time the nature (natural or human-made) of the event. The depth is poorly constrained and has been held to 5 km by the seismologist,” USGS said in a statement. Regional experts differed on their analysis of the tremor, with China’s China Earthquake Network Centre (CENC) service calling it a “suspected explosion”, while Seoul’s Korea Meteorological Agency (KMA) judged it a “natural quake”. “There is no possibility that this could be an artificial quake,” Yonhap news agency quoted a KMA official as saying. A second tremor soon after that test was possibly caused by a “cave-in”, CENC said at the time. The move prompted global condemnation, leading the UN Security Council to unanimously adopt new sanctions that include restrictions on oil shipments. This week marked a new level of acrimony in a blistering war of words between Kim and Trump, with the US leader using his maiden speech at the United Nations to warn that Washington would “totally destroy” the North if the US or its allies were threatened. The North, which says it needs nuclear weapons to protect itself against the threat of invasion by a hostile US, responded on Friday with a rare personal rebuke from Kim, who called Trump “mentally deranged” and a “dotard” and threatened the “highest level of hard-line countermeasure in history”. Washington announced tougher restrictions Friday aimed at curbing North Korea’s nuclear and ballistic missile programme, building on tough new United Nations sanctions aimed at choking Pyongyang of cash.